Very Powerful 629HP 1966 Ford Mustang By Ed Pearce! There are many Ford`s fans around the world. Today, we gonna tell you the story of a 71 years old Ed Pearce, who has been a Ford`s fan almost all his life. Back in the days he was a military man, serving his time in Vietnam, where stayed in the Air Forces compartment till he retired in 1985. Back in those days he owned a `66 Fairlane GT and later he purchased a `85 Mustang GT which he still owns. Now he owns a `55 Country Sedan wagon, which is very dear to him, because it`s a present for his graduation from his beloved father. As he told us, he has an overwhelming urge to create the most awesome small-block without any addition of power, in order to rumble the streets. He admits that he likes Ford engines more than he likes the cars themselves. Later on, on eBay, he discovered a 1966 fastback. Allegedly, it was submitted to professional restoration by RDW Automotive in Reno, Nevada and there was no rust on the body to be found. It has Wilwood front discs, TCP subframe extensions, manual rack-and-pinion steering TCP coil overs, and bracing. Best 1969 Ford Mustang old timers and many others Classic cars for sale! Click on this link! Ed Pearce was very much intrigued by the dynamic compression ratio engines due mainly to his math and engineering background. Sometime ago, Ed Pearce has purchased a DynoSim version in order to use its determined mathematical models that almost correctly simulate the functioning of a normal engine. What Ed Pearce has learnt is that if one realistically and correctly describes the engine`s operation to DynoSim, it shall give the most correct results. Ed opted for a 302 block being the base of his creation of an engine, and when you take a glimps inside, under the hood it shall look like the car was born with it. Ed made a list of 4 s basic simple programs to do the dynamic compression mathematics correctly and as fast as possible in order to do the calculations of the camshaft specifics. The engine had a long walk to go, before it met all Ed`s criteria. Ed created this type of engine and passed the work all the way to Panhandle Performance located in Lynn Haven, city of Florida, or to be more precise to Mark Biddle. 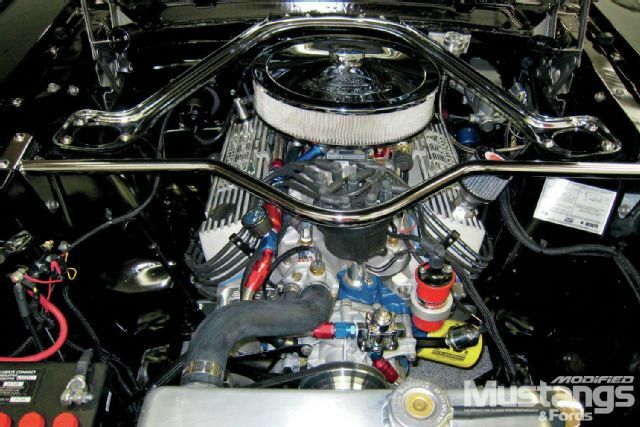 Shortly, it is a 363ci stroker that responds every Ed`s need and at 7,250 rpm, boosts 629 horsepower. It is 1.732 horsepower/ci. 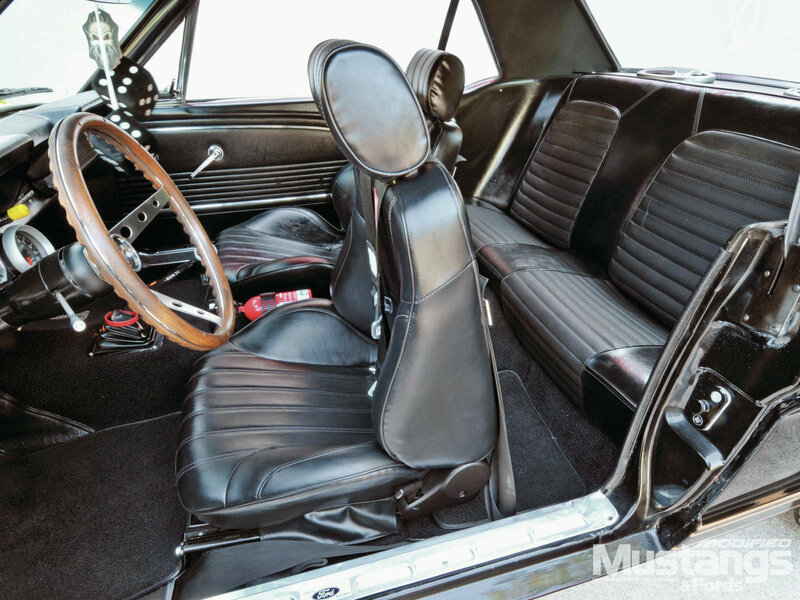 It has a 363ci V-8 engine with Dart 302 SHP bloc, 3.4-inch stroke, 4.125-inch bore, 1.65:1 ratio, Mahle forged aluminum pistons, 3-inch collectors TD shaft rocker arms, 770-cfm Holley Street Avenger for street use, 0.665-inch intake lift and exhaust, front coilovers from Total Control Products, 2.08-inch/1.60-inch valves, Pro Systems one thousand horses for carb, Shelby style fiberglass hood, 10¾-inch Wilwood disc/stock drums, 2¼-inch primaries, Flowmaster mufflers. The transmission is a G-force T-5 manual one. The paint job was done by Spraycraft from Reno, NY. 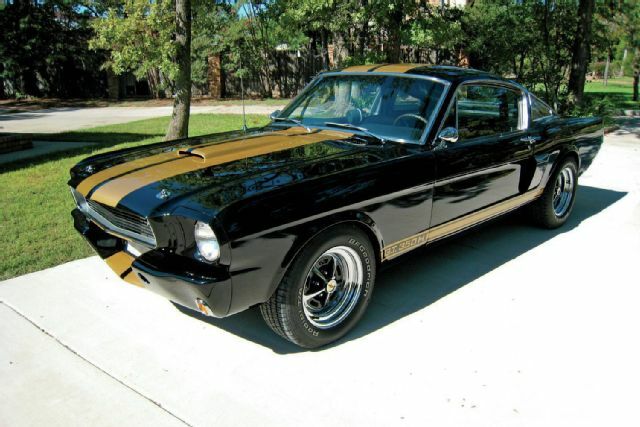 The car also includes Raven black with Shelby gold stripes. The tires are B.F Goodrich. There is also a centerforce dual friction clutch. The wheels are Magnum 500, 15×7 front, 15×8 at the rear end.